I was personally recommended to Carol by a neighbour and on our first meeting I realised that I had chosen well. Carol is a very likeable person. She is fun to work with and has a natural eye for garden landscaping. She suggested trees, shrubs and plants that were really interesting but she always listened to my preferences and did not try and push her own ideas above mine. Her recommendations were always backed up by photos on her i-pad so that I could imagine exactly what she had in mind. The first project at the top of my garden, has transformed a neglected area (where a large tree had fallen down) into a delightful area of trees, shrubs and plants and the overall effect of different shapes, colours and foliage is most pleasing to the eye. The second project was the border in front of a new drive. This design replaced a huge hedge which lacked interest and shape. Carol’s choice of shrubs has been the envy of the road! 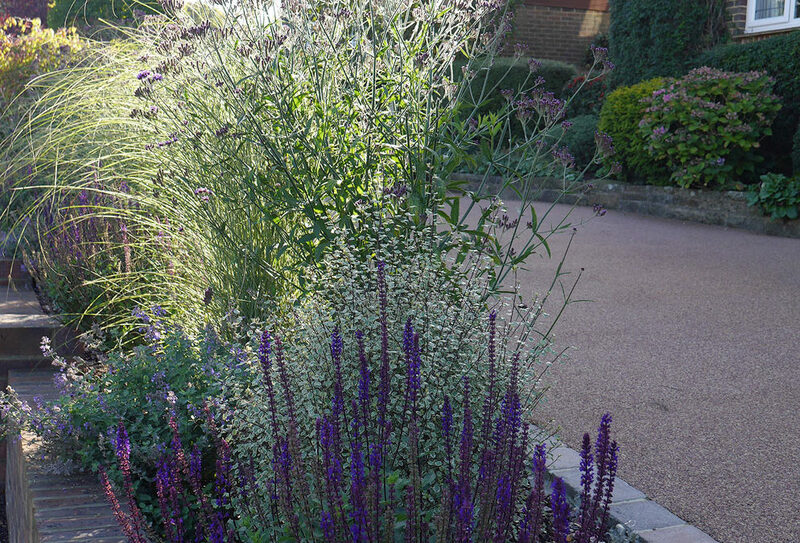 I am still getting lovely comments about my border a year on from when it was planted and it is a joy to pull into my driveway and feast my eyes on the beautiful variety of plants and shrubs. I wholeheartedly recommend Carol Bridges to you.